An exciting featherweight bout between Noad Lahat and Brian Moore is in the works for Bellator 210 in Oklahoma. Bellator MMA are looking to end the year with a bang and their Bellator 210 fight card is about to have another exciting fight added to it. Sources close to Jim Edwards of MMANytt have informed us that a featherweight bout between Noad Lahat and SBG Ireland’s Brian Moore is in the works for the event taking place at the WinStar World Casino and Resort on Nov. 30. Moore (11-6) is coming off the back of a win over Giorgio Belsanti at Bellator 196 which he won via a guillotine choke in the first round. Prior to that win, Moore stepped in at short notice and pushed AJ McKee to his limits in the main event of Bellator 187 in Dublin, Ireland last November. Moore has a 2-2 Bellator record with a win over Michal Ho?ejší and loss to Daniel Weichel. 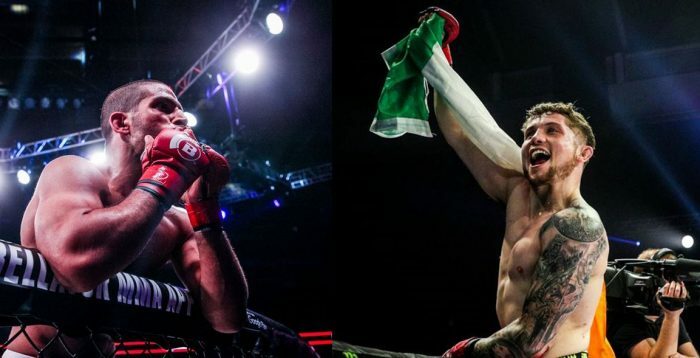 The SBG Ireland man will now fly across the Atlantic to take on his Israeli rival in Oklahoma. Lahat (12-4) is a five-fight Bellator MMA veteran having also fought in the UFC three times. The Israeli’s three wins in Bellator have come against Scott Cleve, Lloyd Carter and Jeremiah Labiano. In his most recent bout, Lahat faced the Bellator bantamweight champion Darrion Caldwell and lost via TKO in the second round. Bellator 210 will be headlined by a heavyweight main event with Melvin Manhoef taking on Chidi Njokuani.